Although devoid of much flora for most of the year a highlight of a Central Kalahari Reserve safari experience is seeing the varied plant life after the first rains in late October / early November. The Kalahari is notable for its lack of annual water courses. The Okavango, which flows year-round, dissipates at its Northern border. The climate is generally characterized by hot summers, and warm days and cold nights in winter. The rainfall months are in summer, from October to April. The very dry southwestern regions have a mean annual rainfall of only 150mm. Despite the absence of valuable surface water, the Kalahari remains a well vegetated desert. This is due to the nature of the Kalahari sand, which tends to thicken to retain water. Even though sandy regions are not considered beneficial for plant growth, this type of sand has the ability to trap and retain water from the short bouts of rainfall for longer periods of time.The Kalahari plant life consists primarily of savanna-type vegetation. Toward the more arid regions in the south, the prominent vegetation consists of grasses such as - Aristida (three awns), Eragrostis (lovegrass) and Stipagrostis, as well as the trees and shrubs such as Acacia, Commiphora, Colophospermum and Terminalia. The 'shrublands' are located in the more arid south-westerly regions and extend into South Africa and Namibia. The diversity and biomass of existing plant life increases in a north-easterly direction. These areas, locally known as thornveld are often characterized by dense Acacia and shrub thickets. Remaining areas to the north are exclusively covered by tree and bush savanna with areas of dense vegetation including varieties such as the Mopane tree. 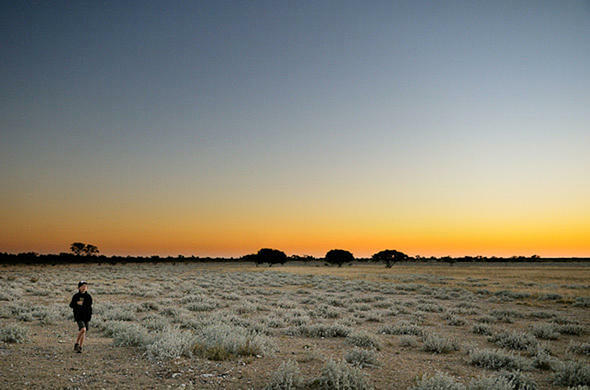 North east of the dessert the soil of the Kalahari supports woodlands. The variety of flora that is sustained by the Kalahari Desert is indeed testament to the remarkable life-giving forces of this region.